As Summer 2013/14 hots up it's time to shimmer and shine as never before. Metallics rule and luminous is cool. It's a bright, bright world that glows and glistens as the temperature soars and the sun dazzles... and we come out to play. VS Sassoon launches the Luminous Collection just in time for you to shimmer this summer. 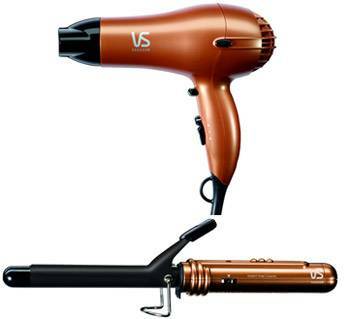 Comprising a 2000W Dryer and a matching 19mm Barrel Curling Tong in a choice of dazzling copper or gold finish, this radiant, shiny collection is the ideal Christmas gift and summer styling kit. A powerful 2000w dryer for quick and easy drying and professional results. A choice of 3 heat / 2 speed settings making it perfect for all hair types from the finest to the thickest. Choice of dazzling on-trend copper and gold metallic finish. Plus bonus coordinated metallic knotted hair elastics so you can create a very finish look for all the latest high pony styles and half-up dos. 19mm ceramic curling tong for perfect curls every time. Create a range of summer curl styles from Boho beach babe to Hollywood glamour queen. Multiple heat settings so you can choose the exact setting for your hair and for the result you want to achieve. A brush sleeve for smoothing and shaping ends. Plus bonus coordinated metallic knotted hair elastics.